I’m having to write this post very quickly! My internet connection here at home is being a bit temperamental and this is the first chance I have had to connect today…so here we go! It’s coming up for the 4th July (cannot believe that we are so far into the year) and 4th July in the States is of course Independence Day. Being a ‘bit’ of a Yankophile at heart, I love to look at all the red white and blue themed parties, decorations and goodies in the magazines. Americans really know how to do celebrations well. Last year I made mini apple pies on sticks for Independence Day. 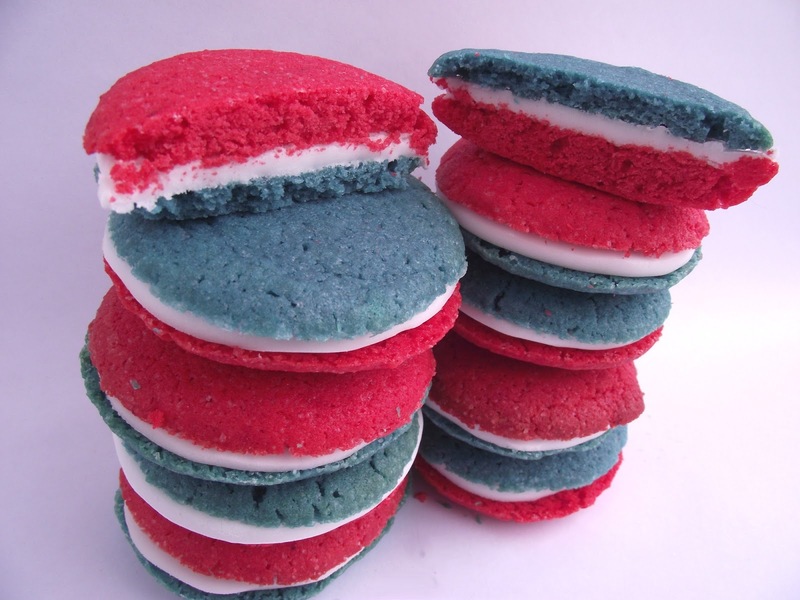 This year, I thought I would go all out with the colour and make red white and blue sandwich cookies. If you are squeamish about food colourings – look away. There are some colourants in these as you can probably tell. The centre of the cookies, is an idea I pinched when watching Anna Olson make homemade Oreos on her TV show. The white stuff is simply rolled out sugar fondant icing. 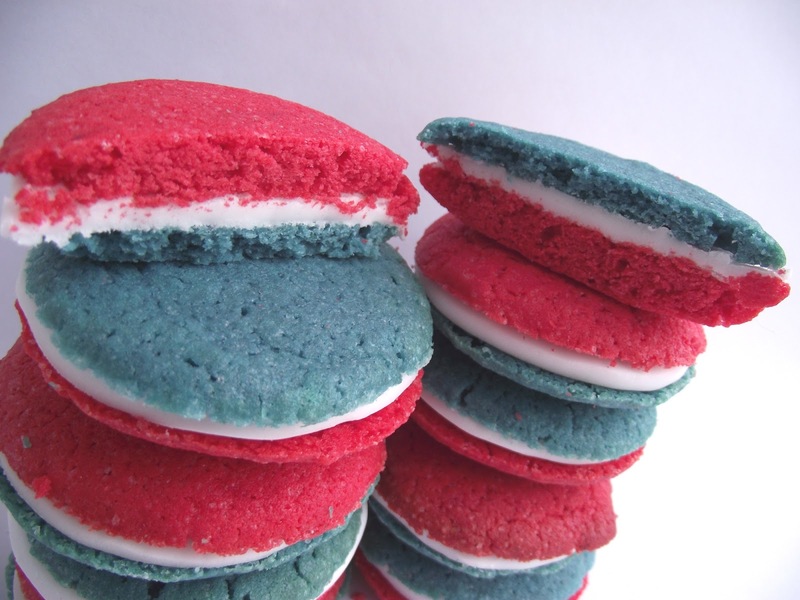 It tastes lovely with the cookies, which are a texture somewhere between soft cookies and whoopie pies. Very delicious and here is how I made them. Pre-heat the oven to 160oC. Line a couple of cookie sheets with greaseproof paper. In a bowl sift together the flour, salt and baking powder and set aside. In a mixer, beat together the butter and sugar until light and fluffy in colour. Next add the eggs, one at a time, beating between each addition. Add the vanilla and mix this through too. Lastly mix in the flour, combing just until no streaks of white can be seen. Separate the cookie dough into two equal amounts. Colour one half red, the other blue. The amount you use will depend on whether you are using liquid or gel, and how deep a colour you want. When they have been coloured, wrap the dough in clingfilm and pop both of them into the fridge for about 30 minutes, to firm up slightly. After the 30 minutes, break off pieces of dough roll into balls about an inch in diameter. Flatten slightly and place on to the cookie sheets, leaving space between each one as they do spread when baking. Pop into the oven for 10 minutes, keeping an eye on them, you don’t want them to brown on the edges if you can help it. Remove from the oven and allow them to cool completely. Match red and blue cookies up going by size. As they spread in the oven, they are all a little different in size. Next roll out the icing (thickness is up to you) and cut circles with a cookie cutter the correct size for the cookies. Spread each side of the fondant discs with a little water before placing a cookie either side and pressing together lightly. The water makes the icing stick to the cookies. 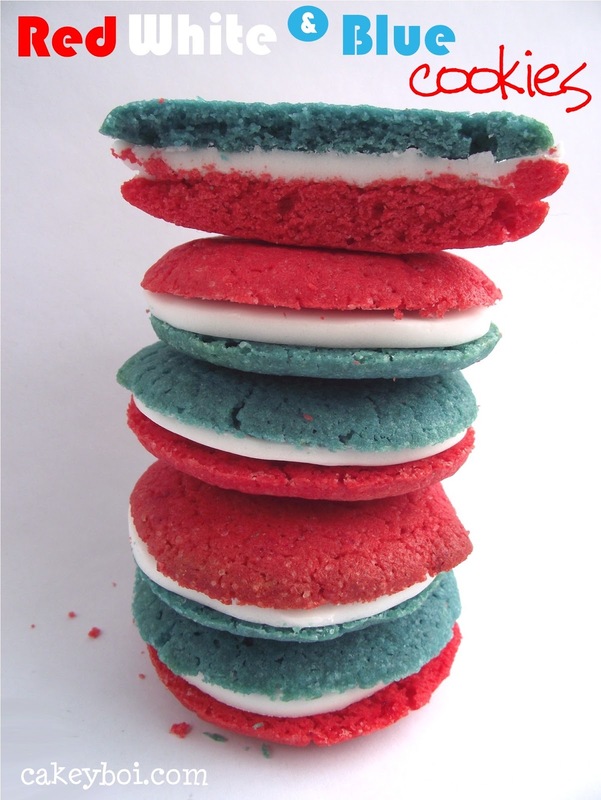 And there you have red white and blue sandwich cookies perfect for any Independence Day party. Of course, you could change the colours up for whatever festivity you are celebrating. 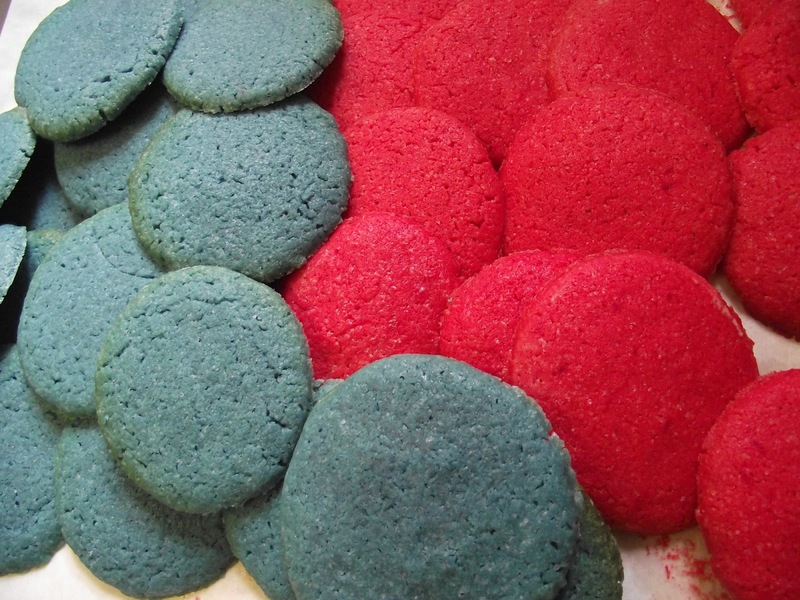 Pastel shades would be nice for Easter, red and green cookies for Christmas. Happy baking! Now off to see about my broadband – grrr! Those colours may not be permitted within the EU! !